Senna tea is a popular herbal laxative tea made from the senna plant (typically Cassia acutifolia or Cassia angustifolia). The active components are compounds called anthraquinones, which are powerful laxatives. Although senna is available as a tea or herbal supplement, it is also FDA-approved for short-term use as a stimulant laxative and is found in nonprescription, over-the-counter products. Senna tea is most commonly used for occasional constipation. Some proponents suggest that drinking the tea can also promote detox and weight loss, but it isn't considered a safe way to lose weight or reduce body fat. It is sometimes used for irritable bowel syndrome (IBS) and bloating. Additionally, senna has been used for colon cleansing prior to undergoing colonoscopy (a type of medical procedure widely used in screening for colon cancer) when used in conjunction with other agents. The active compounds in senna have a strong laxative effect. They work by irritating the lining of the colon, promoting colon contractions and bowel movements. Senna also prevents water and electrolytes from being reabsorbed from the colon, which increases fluids in the intestines and softens stool. 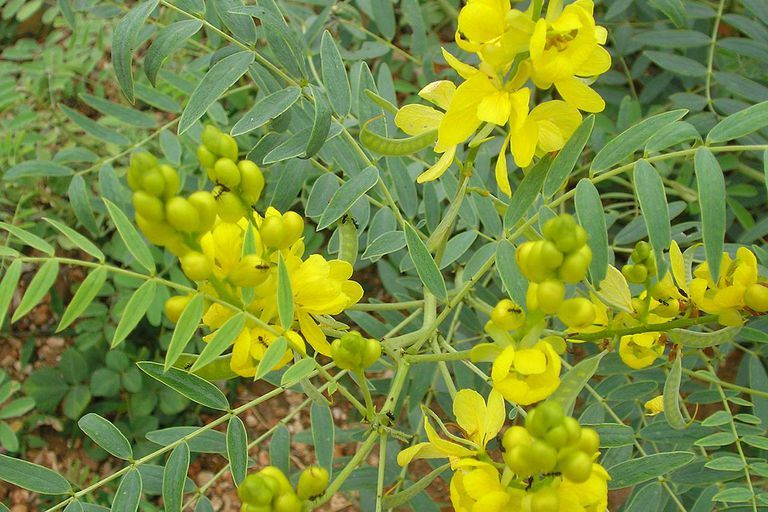 While a number of studies have tested the effects of senna in powder or capsule form, very few studies have looked at the potential health benefits of drinking senna tea. To date, there is no evidence that senna tea can help with detoxification or stimulate weight loss. Senna typically starts working within 6 to 12 hours after taking it. It is often taken prior to going to bed, creating the urge to defecate the next morning. The challenge with taking senna tea is that, unlike capsules, it is difficult to control the dosage when brewing a cup of tea. Even if the amount of the active compound in each teabag were to be listed, the steeping time would affect the dosage. Also, the amount of active ingredient varies from product to product, and some senna tea products are combined with other stimulant laxative herbs (such as cascara sagrada or rhubarb). Side effects are generally mild and limited when used in the recommended amounts for the short-term treatment of constipation. Stomach discomfort, cramps, diarrhea, nausea, and vomiting are the most common side effects. If you have Crohn's disease, ulcerative colitis, appendicitis, senna allergy, diarrhea, dehydration, abdominal pain, or a condition that causes intestinal obstruction, you shouldn't take senna tea. If you have any type of heart, liver, or kidney condition, it's crucial that you consult your doctor before using senna. Senna may interact with certain drugs and supplements. Taking senna with diuretics, for instance, may cause potassium levels in the body to become too low. Although in some cases, senna tea may be used for a longer period of time when under medical supervision, longer-term use of senna tea and higher doses have been linked to serious health problems such as liver injury, electrolyte disturbances, and changes in heart rhythms. In a 2005 report from the Annals of Pharmacotherapy, a 52-year-old woman reported to have ingested one liter of senna tea every day for more than three years and suffered acute liver failure. The report's authors determined that the patient's liver damage was likely the result of her excessive intake of senna tea. If you are pregnant or breastfeeding, consult your healthcare provider before using senna tea. If you or someone you know is experiencing constipation, it's a good idea to talk with your healthcare provider if you haven't already. There are many causes of constipation, and some can be effectively treated with other measures like adding certain foods to your diet. In some cases, constipation may signal an underlying condition (such as a thyroid disorder). If you're still considering trying senna tea, keep in mind that the amount of the active ingredient in the tea will vary from product to product and on the steeping time. Using an over-the-counter senna drug product with a standardized dose will give you a more precise amount, making it less likely that you'll get more than the desired amount. Finally, not everyone responds to senna tea. If you don't notice a difference in your stools after taking the recommended amount, don't up your intake as it could result in unwanted effects. Acs N, Bánhidy F, Puhó EH, Czeizel AE. Senna treatment in pregnant women and congenital abnormalities in their offspring--a population-based case-control study. Reprod Toxicol. 2009 Jul;28(1):100-4. Vanderperren B, Rizzo M, Angenot L, Haufroid V, Jadoul M, Hantson P. Acute liver failure with renal impairment related to the abuse of senna anthraquinone glycosides. Ann Pharmacother. 2005 Jul-Aug;39(7-8):1353-7.